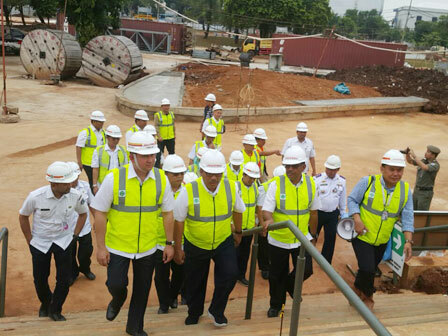 Jakarta Provincial Government monitors BMX Venue construction at Rawamangun Velodrome, Jalan Balap Sepeda, Pulogadung, Jakarta Timur.
" From target 75 percent, it has reached 78 percent. We hope its progress could be faster"
"From target 75 percent, it has reached 78 percent. We hope its progress could be faster," said Agus Suradika, Acting Governor Deputy in Tourism and Culture on the location, Wednesday (1/17). He hopes BMX venue construction could be completed in April 2018. "It has capacity 3,000 people with tribune capacity 2,000 people and equipped with good air circulation," he informed.